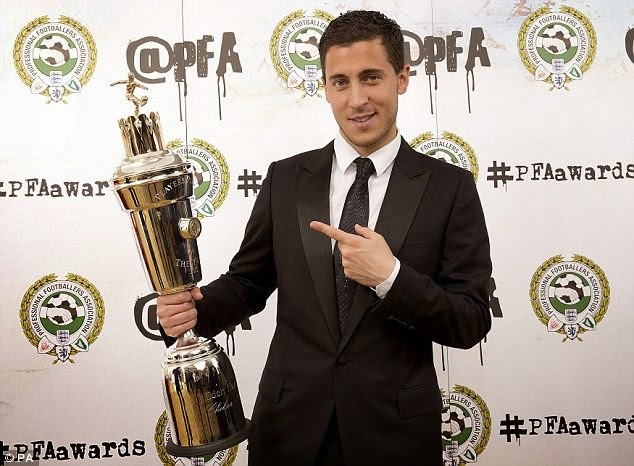 ‎Jose Mourinho has come out with what seems to be music in the ears of Chelsea's play maker, Eden Hazard, by insisting the player is only world's third best behind Ronaldo and Barcelona's Messi. The Portuguese tactician ‎maintained that despite the enormous potential of the Belgian winger, the English football 'culture' may scupper his growth. Mourinho, speaking to The Sun said: 'After Cristiano and Messi, Harzard will‎ be next. I don't see anyone else. 'You can see the potential, the evolution and the way he's been holding on to his profile as a person. 'The world still hasn't reached him. He is still a humble kid‎, a team player, nice and with a family life. 'But I also believe that, behind phenomenal players like Ronaldo and Messi, there's something close to an organised campaign'. The controversial tactician who's famous not only because of the silverware he has under his belt, but also is renowned skill of mind games, went on‎ to have a dig at English football by saying: 'It's a 24-year-old boy, who plays in a country where there isn't a culture of best player of the world. However, the self acclaimed 'Special One' maintained that Harzard is waiting to take over the world football stage from Cristiano and Messi by insisting: '...put him next to Ronaldo and Messi, wait for them to be 33, 34 and 31, 32 and Harzard would be next'.